I remember that first bite vividly. The whole family was staring at me, waiting with bated breath to see my reaction. This was an extremely important dinner, as it would be the deciding factor in shaping my future. You think I’m kidding, but I was specifically told that I couldn’t marry into the family unless I liked pierogies. It’s a lot of pressure for someone who’d never had sauerkraut, let alone heard of a pierogi. I knew about pasties and pot pies (I am Irish, after all), but pierogies? My husband’s family is Polish by descent, and celebrates by eating pierogies every Christmas Eve. It was amazing, needless to say (as anything drenched in melted butter tends to be). I was surprised by the contrasting flavors–vinegary sauerkraut, moist, chewy shell. It was what I thought it would be: simple, recognizable; but I was surprised at how well the few ingredients complimented each other. 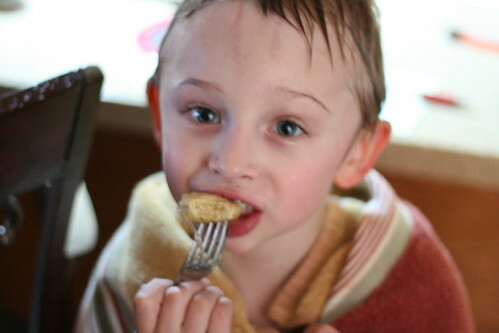 We’ve tried pierogies a few times on our own, to great success. But nothing compares to that family meal. During the holiday season when everything is so sweet-centered, it’s nice to have a meal that’s tart and savory. And now I have some bad news. My mother in law starts this process first thing in the morning. And she’s a very early riser. 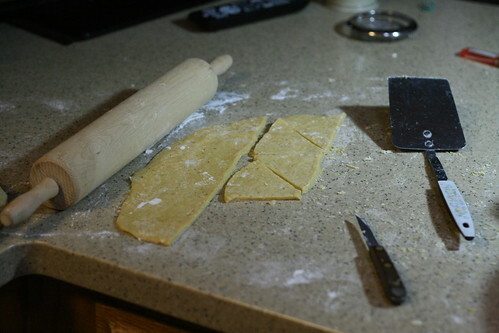 I came up the stairs and the dough had already been assembled and she was rolling it out and cutting it into triangles. I don’t have the photo step-by-step that I normally include. The good news is that this means I’ll just have to make pierogies sometime soon. Darn, huh? It starts with eggs and flour. A lot. To quadruple/billionuple her normal recipe, she used two dozen eggs and 12 cups of flour!! 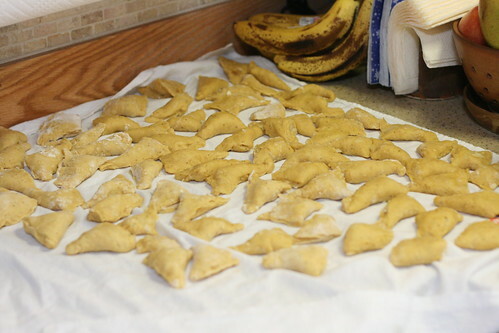 (Don’t worry though, we seriously love our pierogies, and that amount of eggs and flour gave us about 80 of them. 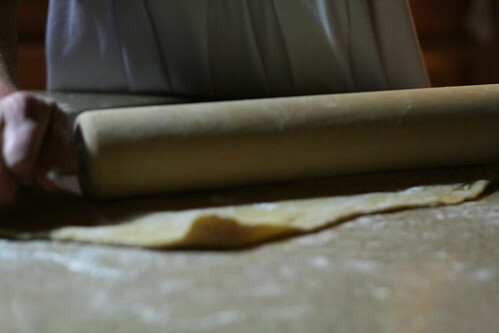 You can use 3 cups of flour and 6 eggs to start) She also added a bit of salt and pepper to taste. 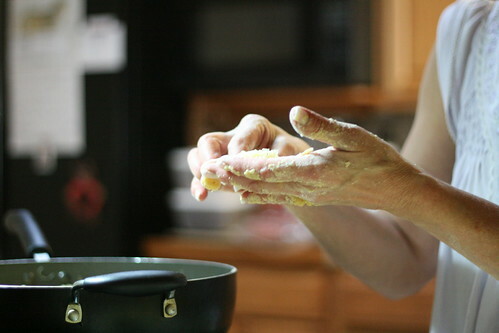 You can start with a wooden spoon, but eventually combine with your hands to make a pie crust like consistency. Roll it out pretty thinly, and then slice into triangles. While that’s going on, start your sauerkraut in a frying pan with some buttah. We usually use a whole, very large, jar. The frying time of the sauerkraut is a bit of a debate between my husband and his mother. She likes to cook it for quite awhile, but my husband likes to cook it just until the kraut absorbs the butter and is heated through. I tend to side with my husband, because I really like the flavor of the kraut to burst. 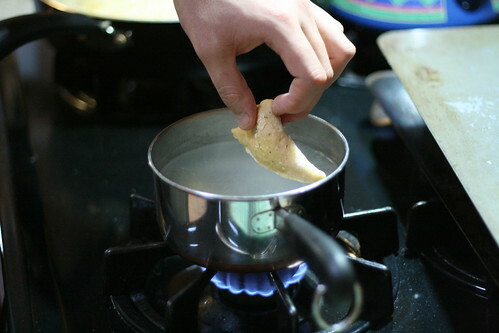 Fill each triangle with kraut, and pinch the edges to close. 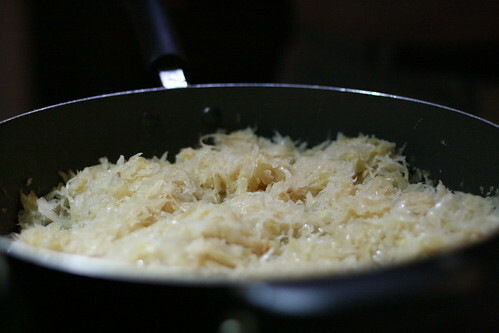 The kraut will be moist enough that you shouldn’t need to add water or egg wash to the edges. Make sure they’re really sealed though! You don’t want any of the good stuff to escape. 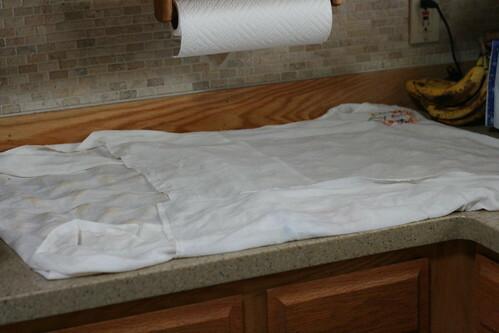 Place sealed pierogies on a slightly damp towel. 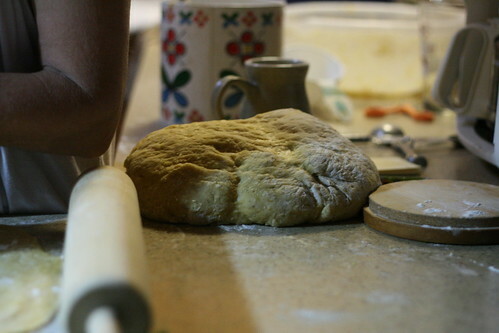 Repeat the process again and again until you run out of dough. If you run out of sauerkraut, make more, silly! My husband is ready to go as soon as the last pierogi is stuffed. This usually results in a few of the resting pierogies disappearing. I may or may not have consumed a few of these a little early too. Can you blame me? When it’s actually dinner time, bring a big pot of water to a boil. Add the pierogies in batches. You’ll know when they’re ready because the dough will change color and harden. 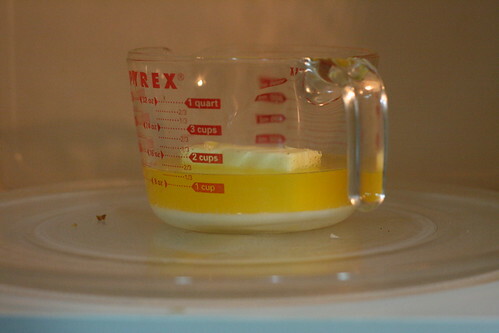 Before you pull them out of the water, melt “some” butter. And now I have more bad/good news. We were in such a hurry to eat that I didn’t snap any photos of these beauties plated and ready for eating. Further reason to make them again, yes? I’ll just have to post a follow-up…and buy more butter. My family makes a sauerkraut recipe for Christmas Eve too! It’s called Krautstreudel. 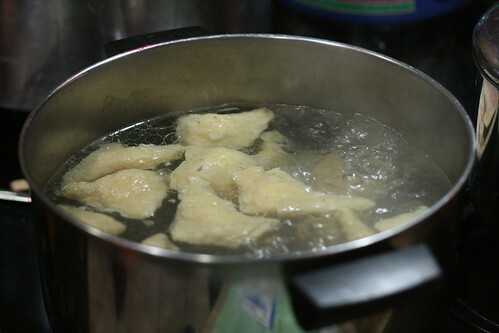 I will get the recipe from my mom and blog about it in the next few weeks (and make it, darn!). Basically, you brown hamburger and bacon together and add a jar of homemade sauerkraut and heat it up. Then you spread it over bread dough that is already rolled out and roll it into a giant sauerkraut roll-up and seal the ends. It comes out looking like a calzone, but almost 2 feet long – yum! I learned from John’s mom (cooking the sauerkraut for an hour, making them early, covering them till dinner) but every recipe needs to be modified right? Enjoy!! !